A family recipe scrapbook...it can be big, small, for everyday use or used as a gift, but no matter the reason for making it, it will turn into a family heirloom. The following are just a few ideas that you can use to create your very own. As you go through this outline, try to visualize an open scrapbook. I've assumed a "standard" 10-page 12x12 scrapbook. For example, when you open the scrapbook, you will only see one page – the title page, but as you continue through the scrapbook, you will see the back of one page and the front of another (to create a two-page section). Option 1 ("Just Like Mom"): Is there a favorite picture that you of your Mom? Take that picture, mat it and adhere it to an off-set piece of patterned paper. You can use a title like, "Just Like Mom Used to Make," with a sub-title of "A Collection of Family Recipes." 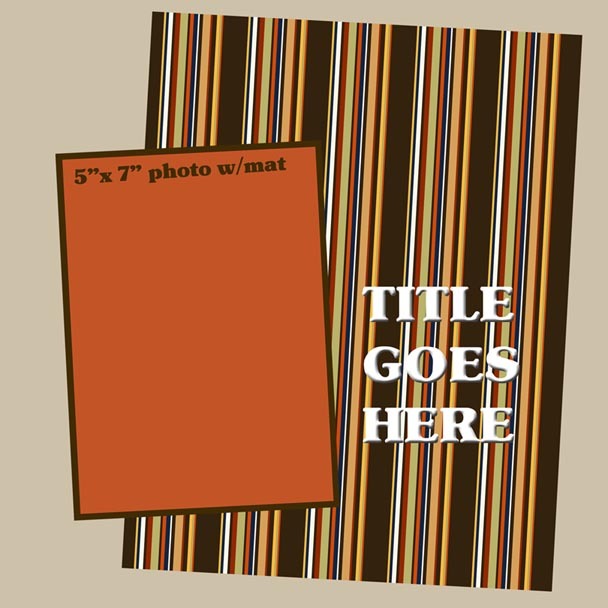 Since there isn't very much going on on this page, you can use the title as an opportunity to be creative and use a combination of scrapbook supplies, like cardstock letters, to really make the title stand out. Option 2 ("Dedication"): You can use the same layout as above, but instead of using patterned paper, use that space as an opportunity to dedicate your cookbook. Write a letter to your family and tell them why you are creating this special heirloom. If you want to do both, you can use Option 1 as the Title page and Option 2 as the last page (Page 10 Back). What is your favorite recipe that your Mom used to make or what was your Mom's most popular dish? Your Mom making this dish. The finished product – I know it sounds silly, but I almost always have to see what I'm making is "supposed" to look like before I will take on the challenge of actually doing it myself. Family gatherings where people enjoyed this particular dish. The ingredients that go into making the dish (see sketch below). If you don't have a lot of pictures to work with, you can just use the left page. Obviously, since you want to get as many recipes in this cookbook as possible, you'll probably try to want to keep the rest of the pages to single-page layouts. If you have them available, use the original and/or copies of hand-written recipes instead of just using a word processor to type them up. Why is this recipe special? Has it been in your family for generations? Is this a recipe that your Mom always made for your birthday? You can use colors that highlight certain colors in the pictures. You can use colors that reflect the ingredients used in the recipe (e.g., red and greens for apples, browns for cinnamon, etc.). If you have a lot of black and white pictures, you can use your Mom's favorite colors. If you want to give your family recipe scrapbook an antiqued-look, or even just a little dimension, try inking the edges of your paper (all that involves is dragging an ink pad across the edges of your paper). Tim Holtz Distress Ink in Walnut Ink or Old Paper always works well. Again, you have two options here. You can use Option 2 from the title page (dedication) or, if you have the time, you might poll some of other family members and get their thoughts on your Mom's favorite recipes – which one they liked the most and why. Gather all the recipes you want to use and any associated pictures first. Jot down some notes for your journaling. Do some rough sketches of your pages, so you have an idea of what will go where and exactly what you need to get from the craft store. If you get to this point and need more ideas for layouts, let me know and I'll be happy to help. Also, if you haven't already seen my Thanksgiving page, I have pictures of an entire Thanksgiving recipe scrapbook. Make some notes on what colors you think would suit each recipe/pictures the best and then go shopping. You may want to take your pictures with you.